Cam's Cinematic Episodes: Film Review - NIGHT AT THE MUSEUM: BATTLE OF THE SMITHSONIAN: Don't Look, Don't Touch. 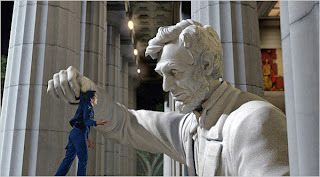 Film Review - NIGHT AT THE MUSEUM: BATTLE OF THE SMITHSONIAN: Don't Look, Don't Touch. The original Night at the Museum was not a very good movie. It was mostly frantic and dumb, with an over-emphasis on loud special-effects and Ben Stiller awkwardly mugging for the camera. BUT, when not being overly abrasive, it didn’t shy away from revealing a certain gentle and whimsical spirit, which made its simplistic and uninspired family message digestible and even slightly moving. Museum also boasted gorgeous cinematography by Guillermo Navarro, with lustrous, fuzzy-fantastical brown and yellow hues helping accentuate the film’s magical premise, and featured an oddly soothing performance by Robin Williams as Teddy Roosevelt, which almost erased my spiteful long-held memories of Patch Adams. Interesting then, that the sequel, subtitled Battle of the Smithsonian – if ever a title promised strident frenzy... – makes the profo undly wingnut-minded decision to do away with almost all of those positive attributes. The earlier film’s focus on family, with Stiller’s single-dad Larry Daley learning to become a dependable provider and positive role model, is thrown clear out the ever-loving window, with his son (Jake Cherry) now downgraded to an exposition-spewing bit part. Similarly, Williams’ screen-time is cut in half, and Navarro’s incandescent work has been dropped in favour of the mood-killing, flat work of John Schwartzman. Sacre bleu, what gives?! Switching extremes, Larry Daley is no longer an undependable, unemployed sponge, but rather an undependable, w orkaholic douchbag, who carries around a Blackberry and talks on his cell phone a lot. Apparently, in the short-time between films (a year-and-a-half, tops. 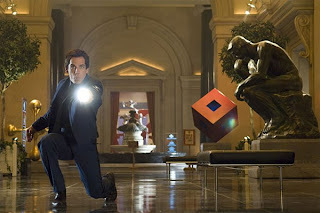 ), Stiller’s character has managed to parlay his museum nightwatchman gig into a lucrative inventing career, hocking glow-in-the-dark flashlights on TV alongside George Foreman. However, all is not well at New York’s Museum of Natural History where, if you’ll recall, the exhibits come to life at night through the power of a mystical – and plasticky-looking – Egyptian tablet. Due to demands for modern technological learning tools, curator Dr. McPhee (Ricky Gervais) has decided to replace the museum’s star attractions with multimedia-friendly holograms. 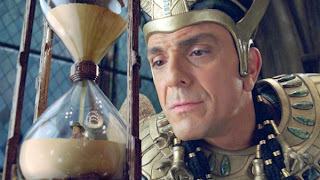 Nevertheless, there is still adventure to be had, as the goofy gang of wax figures and miniatures are shipped off to Washington D.C.’s Smithsonian archives, which becomes a l ot more chaotic when the magical tablet restores the livelihood of the evil, but dim-witted, warlord Kahmunrah (Hank Azaria – camping it up with a fey performance which ostensibly combines Jeremy Irons with Dame Edna). Dejected and peevish after many years of slumber, he declares war on the lovable exhibi-crew and dedicates himself to using the tablet to lure an army of monstrous demon warriors into the real world. After receiving a frantic call from pint-sized cowboy Jedediah Smith (Owen Wilson), Larry skedaddles over to D.C., infiltrates the gargantuan storehouse, and teams up with Amelia Earhart (lovable Amy Adams with a Katharine Hepburn accent and very, very tight pants), in a heroic quest to save the world from certain doom. If all this sounds convoluted beyond all get-go, that’s okay because returning director Shawn Levy have given the story ev en less thought than I just did transcribing it. 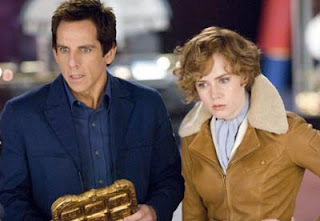 Whether the WGA strike is to blame or not, Night at the Museum: Battle of the Smithsonian seems remarkably script-free. Rather, we sit, in slowly-dawning horror, as Levy repeatedly turns his camera on his comically gifted actors for stupefying long stretches, as they (seemingly) improv sweat-stained stretches of comedic “gold”. 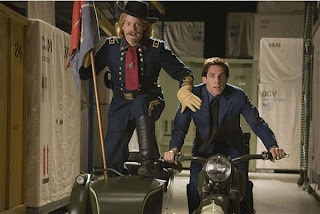 There is one endless scene featuring Stiller riffing with a gung-ho guard played by Jonah Hill that should be bottled up, labelled and sold as “Anti-Funny”. Also, if I had to guess, Azaria fabricated 90% of his dialogue on the fly. Even the effects forget to infuse any sense of joviality or enchantment to the kid-friendly enterprise. The first film contained occasional moments of actual wo nder, whereas in Smithsonian it just feels like insipid CG junk-candy. Majestic towering statues, splendorous paintings and captivating denizens of the deep unceremoniously leap into action, only to be overwhelmed by the frenetic bursts of 1’s and 0’s carelessly erupting around them. There’s even a chaotic scene spoofing 300, for no discernable reason other than to shamelessly mimic a recent hit film. With all the money and resources available, why not inspire your young audience and paint dazzling creative visions which they can take with them when they leave the theatre? Only one infinitesimal moment manages to become something special; as Stiller and Adams soar over the Washington monument’s reflecting pool, lovely echoes of Lois and Superman’s night-flight in 1978’s Superman: The Movie can be almost be heard. Night at the Museum: Battle of the Smithsonian should be ashamed of itself. It’s the most contemptuou s and worrying brand of high-gloss entertainment: a shamelessly pandering attempt at robbing young movie-goers of the gifts which can be derived from remarkable visual sights and stirring, fanciful storytelling. After sitting through this inert, turgid mess, I would recommend that the filmmakers join alongside future exhibits and get stuffed. *Originally printed in SFU's The Peak: June 1st, 2009.